The management of organisational change is very important for the long run success and sustainability of the business. Business that has loyal workers will have the process of change management easily adopted. People of the organisation may be resisting change that will pose threats for the organisation. The highly competitive industry and dynamic environment requires the organisations to manage change properly. There are many theories and approaches developed by the hard work of researchers that have developed guidance for the organisation for adopting the appropriate practices that would increase the chances of the organisation to manage change in an effective and efficient manner (Taylor, P. & Hirst, J. (2001). The process of change management involves changes in the direction, capabilities and structure of the organisation (Moran & Brightman, 2011). The study conducted by Burnes (2004) states that the change is an inevitable thing that will take place in the life of an organisation having an impact on the operational and the strategic level of the business. The organisation should rigorously research about the future of the business so that proper planning is conducted that will enable the organisation to achieve the objectives of the business. The main emphasis was laid around the fact that the change in the organisation cannot be just focused without the organisational strategy being considered. It is very important that the business has aligned the objectives of the employees with the organisational objectives to increase the chances of success and growth. Businesses that are not effectively running have identified certain issues that restrict them to adapt to the changes that are essential for the long run success and growth of the business. Graetz (2000) has identified that the information revealing about the increasing trend towards globalisation, the deregulation, growing knowledge of the employees, changes in social and demographic trends all over the world have led to a change in the perspective of the leadership of the organisation to consider change management very important. The advancements around the world regarding the trends and the globalisation have not been ignored by the business organisations. Change management is crucial for businesses as there are many factors that have to be considered. Information not shared properly with the employees of the organisation so it will not motivate the employees to contribute towards the efforts of the organisation to manage change effectively. The work of Balogun & Hope (2004), have shared the results of about 70 percent organisations that are not capable of successfully implementing change in the organisation. There is work conducted by the people in the past regarding change management. It has been identified that the change that takes place has been equal to the level of change in the environment of business in the current time (Balgon & Hope, 2004; Carnall, 2003). The change that takes place in the organisation has been considered to have all shapes, forms and sizes. There can be drastic changes in the structure of the organisation, the product line can be diversified further and the number of employees needed for the different positions in the organisation can also change with time. The high level of competition in the industry has created certain challenges for the organisations to acquire the best possible talent in the industry to support the organisation. The information that is available for the organisations is very important for the people to improve the operations of the business in the long run (Kotter, 1996). The change management is a crucial factor for the business organisations because that is the requirement for businesses to stay in competition. There has been a high level of focus on the importance of the management of change in the organisation but there is less empirical research conducted to support the topic (Guimaraes & Armstrong, 1998). The work of Senior, (2002) has identified the three categories that are focused from the perspective of the characteristics of the change. The important concepts like total quality management (TQM) and the business process re-engineering (BPR) along with other initiatives for the change have not been focused very much. The main area of focus for the organisation is the sustainability and the long run growth of the business so the management of change is crucial (Pettinger, 2004). The work of Rieley & Clarkson, (2001) has clarified that constantly changing organisations are not performing well because it is very difficult to manage change that is taking place regularly. The routine work performed by the employees of the organisation allows them to learn from their mistakes and specialise in the tasks they perform so it is difficult to adapt to new changes in the organisation. If the business has the ability to identify methods that would enable the organisation to manage change effectively that will be fruitful. Luecke, (2003) states that changing environment has allowed employees to mould with the surroundings to adapt properly to the business changes to be able to survive in the competitive industry. The work of Nelson, (2003) has clarified that the change in the organisation does not occur in a steady manner as the level of change that is experienced varies with the nature of the business, changes in technology and the degree of competition in the industry. Many organisations have developed proper plans and implemented the effective strategies developed by skilled managers to adopt change and manage it properly. Grundy (1993) has been able to identify that the process of change can be manipulated by the organisations by dealing with changes in a proper way by ensuring that the incremental and slow change is taking place at the right time as the organisation prepares the required human resource and other resources for the change management. When the level of change is viewed from the perceptive of the cause of change then Bamford & Forrester, (2003) have identified several factors that the organisation toward the process of change. The planned process of dealing with the change that is going to take place in the organisation is the appropriate strategy as it allows the business to identify the most appropriate practices that will guide the organisation for dealing with the change effectively. If the change is taking place that will result the organisation to pass through different states of changes so it is crucial to deal with it properly to shift the business from an unsatisfactory place to a desirable state (Eldrod & Toppett, 2000). The planned change approach was developed by Lewin, (1946) having the background in the study of intergroup and interpersonal relationships in the community. 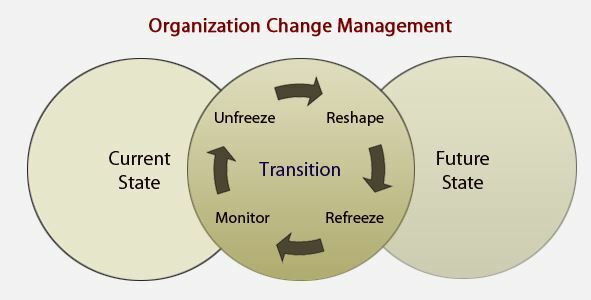 According to the study the individuals have to understand the importance of three main steps for the management of change that include the level of unfreezing present, moving to the new level and then refreezing the current level. It is a good way to discard the previous information to be open to understand and properly manage the new information that is being shared with the employees. The work of Bullock & Batten, (1985) has been highly appreciated regarding the management of change for the organisation as they have developed a four phased model for the planned changes that need to take place in the organisation that involve the exploration, planning, action and integration. The model has laid major emphasis on the process of change that allows the organisation to move from one place/state to another that enables the managers or leaders of the business to adapt to certain changes that are very important for the business. Though the model has gained respect of the researchers in the past but has also faced criticism for the model being focused on the incremental changes taking place at the small scale level, condition that is considered is that organisations are operating in constant environment and movement takes place from one stage to another. The process of change that takes place in the organisation is not taking place in a step by step or predefined manner so it is crucial that effective planning is done to incorporate the needs of the stakeholders of the business in the change management process so it can take place in a successful manner. The proper manner to adapt to changes for the business organisation is to not take the concepts of change in isolation rather develop a set of integrated steps that can ensure that the performance of the business will be good. The information that is being shared by the employees for developing a strategy for the effective management of change is crucial. If the leadership allows the employees to have a say in the decision making process that will increase the motivation, commitment and loyalty of the employees of the business. The importance of sincere employees that are willing to support the organisation in good and bad times cannot be ignored so it is the responsibility of the human resource management department of the organisation to ensure that the employees are very much satisfied with the performance of the managers (Dawson, 1994). The growth and career development opportunities in the organisation should be developed for the welfare and growth of the employees. As the skilled workforce of the organisation will feel comfortable with the practices of the organisation there are higher chances that such businesses will be able to perform well in the industry. To properly manage the change in the organisation by dealing with high level of uncertainty and the complexity a business must emphasise on the development of the open learning systems so that employees are acquainted with the skills, experiences and abilities that are crucial for the growth, expansion, survival and sustainability of the business (Dunphy & Stace, 1993). There are no proper rules that have been developed for guiding organisations properly to deal with the process of change properly but still it is imperative that business organisations continuously work on strengthening the business procedures and operations in a manner that will ensure the proper flow of operations enabling the business to cope with change effectively (Pettigrew & Whipp, 1993). Change is inevitable in the dynamic environment, globalisation and high degree of competition in the industry. It is imperative that organisations develop proper plans for dealing with change in an effective manner. The business organisations that are dealing with the change properly have achieved high level of success as they are able to guide the employees in a successful manner towards the achievement of the goals and objectives of the business. There are many theories and approaches that are developed for the guidance and direction to be provided to businesses but it depends on the nature of the business and the industry in which the business is operating to adopt the proper procedure. The successful businesses emphasise on motivating their employees so that they can adapt to changes properly and perform well in the business environment. Burnes, B. (2004) Managing Change: A Strategic Approach to Organisational Dynamics, 4th edn (Harlow: Prentice Hall). Davidson,M. C. G. and De Marco, L. (1999) ‘Corporate change: education as a catalyst’, International Journal of Contemporary Hospitality Management , 11(1), pp. 16–23. Dawson, P. (1994) Organisational Change: A Processual Approach (London: Paul Chapman). Kotter, J. P. (1996), Leading Organisational Change (Boston, MA: Harvard Business School Press). I hope you enjoyed reading this post on organisational change. There are many other titles available in the business management and MBA dissertation collection that should be of interest to MBA students and academic professionals. There are many dissertation titles that relate to other aspects of business such as strategy, leadership, international business, mergers and acquisitions to name a few. It took a lot of effort to write this post and I would be grateful if you could share this post via Facebook and Twitter. Feel free to add your thoughts in the comments section. Thank you.